Our silky-smooth, luxuriously weighted paper feels clean to the touch and conveys elegant simplicity. Our exquisitely textured, supremely weighted paper has a handcrafted-quality grain that conveys timeless elegance. 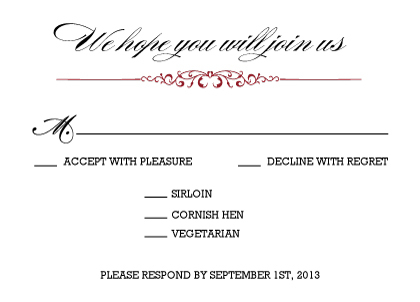 Completely customizable, this beautiful Response Card is perfect for your upcoming event. The Traditions Response Card is a high-quality Response Card that will reflect your individual style since it features a one-of-a-kind design, colorful graphics, and numerous possibilities for personalization. Each element of the Traditions Response Card was chosen specifically with the goal of creating an elegant, first-class Response Card design. Printed on your choice of either premium modern matte or classical felt card stock, this Response Card is made to last, and you can order quantities in as little as 10. If you are looking for the best Response Card, you cannot go wrong with this chic design from LookLoveSend. You can get started adding your information to the Traditions Response Card by clicking the "Personalize" button. View more products like this in the wedding invitations section.